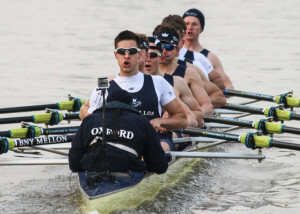 This year’s Oxford and Cambridge boat races are on Sunday 27th March and members of Champion of the Thames rowing club in Cambridge will be watching the races with more than usual interest as we have two of our ex-junior rowers taking part. Nik Hazell will be stroking the Oxford boat in the men’s race at 16:10. Nik learnt to row at Champs in our junior boys squad. He then went on to Hills Road Sixth Form College and then the University of Oxford. He was in the Isis boat in 2013 and 2014 and gained a bronze medal in the British Rowing Championships in 2013. Meanwhile, Peter Rees will rowing at four in the Goldie boat competing in the Goldie vs Isis race at 15:40. Peter also rowed in our junior boys squad before joining Clare College to study Natural Sciences. Champs has a very special relationship with Clare College as we row out of Clare Boat Club. 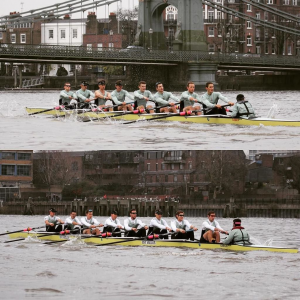 Below are some photos of the Goldie crew practicing on the Thames ready for the big event. If you’re interested in learning to row, we run inductions for rowers of all ages and abilities. We are a relaxed and friendly club offering enjoyable and regular rowing with opportunities for competition and improvement.